Attention! – (part) of the book “The Construction and Repair of Balalaikas” is now available in English or Русский. The article “Building the Prima Balalaika” by Jim Flynn is in both the Big Red Book #2 p. 190 and American Lutherie #17 p. 29. 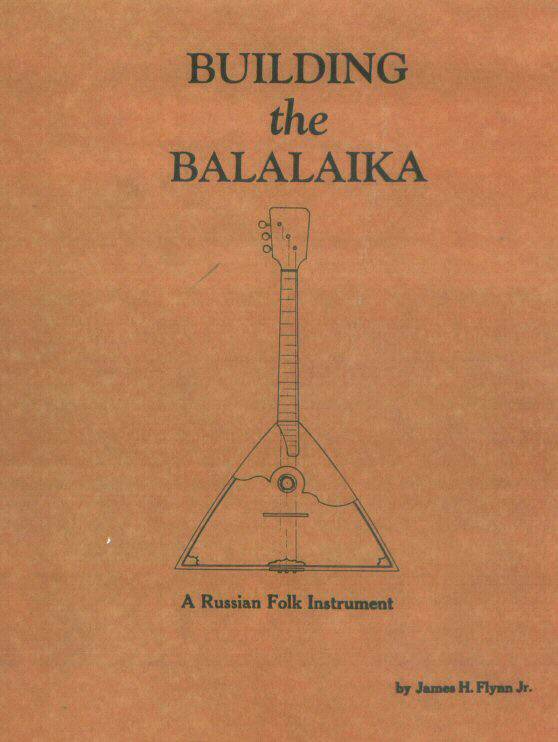 There are a number of other important articles about the balalaika also printed in these sources. The Big Red Book is a highly recommended resource for anyone interested in instrument building. 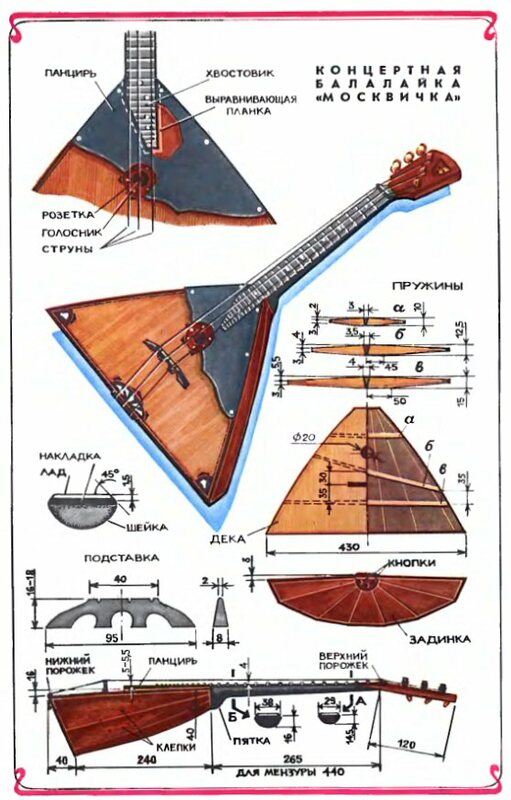 Jim Flynn’s complete book “Building the Balalaika” is self-published and is a fairly detailed description of all of the steps necessary to build the balalaika. It contains a wealth of information that is simply unavailable elsewhere (in English). It has been unavailable for quite some time, but is now available online as a PDF file from the Guild of American Luthiers. 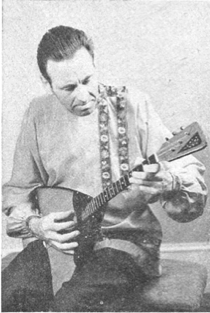 The article entitled “Building a Balalaika” by William Prince (Member of the Fretted Instrument Guild, and of the International Classic Guitar Association) was originally published in Woodworker (magazine) in Britain in 1960. It complements the Flynn book (above) nicely, and has better pictures and drawings. The technology of manufacturing and repairing the most common stringed instruments: balalaika, domra, mandolins, guitars and guslis. A description of the production of instruments for solo and orchestral performance. Covers the technology of woodworking and questions of the organization of production, labor and the environment. 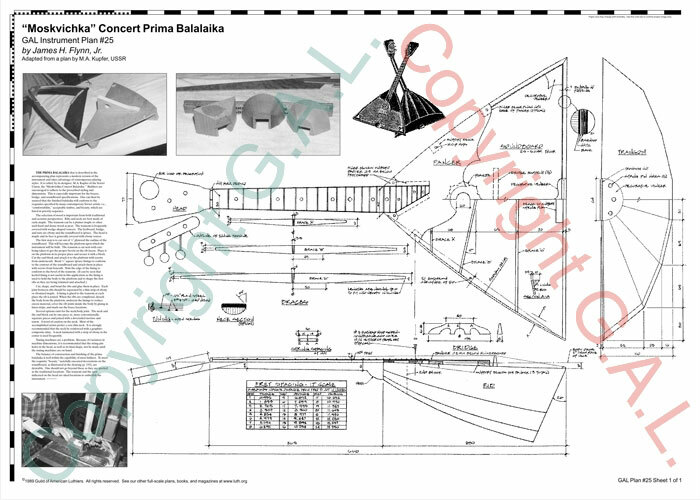 The section on balalaika construction and repair has now been translated into English by Boston Balalaika Workshop and is being offered here as a service to the worldwide English-speaking balalaika community for download as “The Construction and Repair of Balalaikas“. 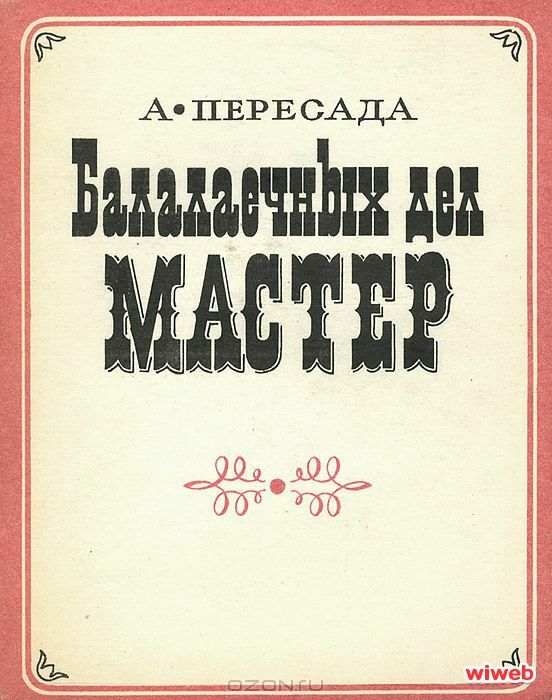 Or the original Russian text is also available as a PDF. The Moskvichka Concert Balalaika by Mark Aleksandrovich Kupfer. Mr. Kupfer and the Moskvichka were profiled in an article “Meet the Makers” in Big Red Book #2 p. 178 or American Lutherie #17 p. 29. The Big Red Book is highly recommended. The Moskvichka Concert Balalaika Plan, adapted in an original drawing by J. H. Flynn from a plan by M. A. Kupfer (USSR) and drawn by John Morgan, is available from the Guild of American Luthiers as Plan #25. There is a scaled-down version of this plan printed in the Big Red Book #2 or in American Lutherie #17. 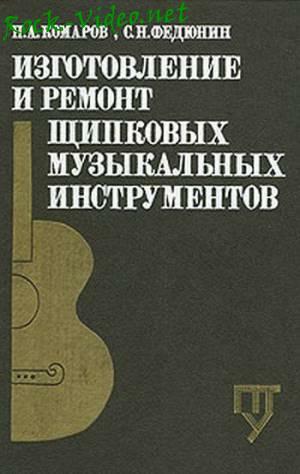 Balalaika Works of the Masters – Балалаечных Дел Мастер, А. С. Пересада (in Russian only – although I’m working on an English translation – Russian Version available here) – about Simeon Nalimov, the Stradivarius of Balalaika Makers in the late 19th/early 20th Century – A short treatise, extremely rare, almost impossible to find, but I managed to get a PDF copy. I believe there are only 2 copies of the actual book in the U.S.! MIMF (Musical Instrument Makers’ Forum provides a wealth of information, resources and assistance for lutherie. Guild of American Luthiers is a great resource for stringed-instrument builders. Check them out. Stewart MacDonald – everything for building and repairing stringed instruments and the source of many of the materials that I needed for this project. Luthiers Mercantile International – like Stewart MacDonald, an amazing resource for everything related to building and repairing especially acoustic stringed instruments and the source of some of the materials that I needed for this project and many tools and materials used on other projects.